Ireland travel technology survey 2016 . 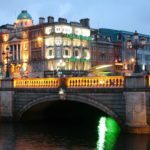 As a follow-on from our Dublin Globe list of the 60+ companies doing travel tech in Ireland, Kevin O’Shaughnessy and I wrote a short history and review of the current state of our sector in Ireland. We included the DNA behind some of the companies, the Aer Lingus / ASTRAL / GPA / RyanAir story (short version), current facilities for startups and in-bound investors, and some thoughts on why the Irish have this attraction to travel technology and airlines.